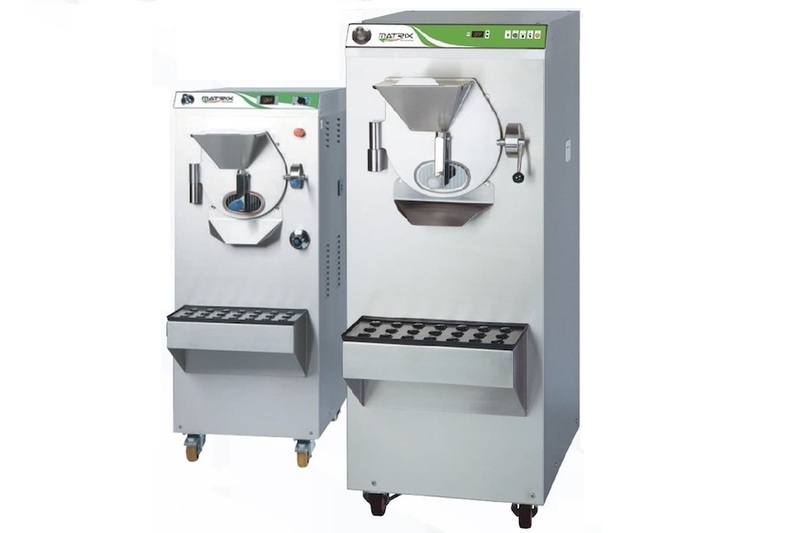 The new range of Hercules batch freezers is able to deliver a dry and creamy GELATO, stable in its structure which can be served immediately with a scoop onto the cone and which will keep fresh for sale without successive static reductions of temperature. The micro-crystals obtained through this process allows the long lasting display of product "in mountain" for a considerable period of time without crashing the structure. It is possible to make different kinds of decoration with chocolate, cookies,fresh fruit or syrup as desired, which make the result bright, attractive and noticeably more appealing. The new range HERCULES renews the models introduced in 1993 and to date products with great success and exported worldwide. Today the new system Tec Tronic and new technical details and construction, make HERCULES a batch freezer that is unmatched. The agitator, three spokes, devoid of central axis, it is completely made in a single piece of stainless steel, with helical design, for the total expulsion of the ice cream; maximum rigidity has new scrapers spring loaded and self-regulating, for the constant cleaning of the cylinder.